There are two species of blazing star at Rettenmund: dwarf blazing star (Liatris cylindracea) and rough blazing star (L. aspera). The former is less common, and well worth seeing. Both species were in full bloom on Sunday. We can't guarantee how long they will last. Because Rettenmund can be reached so conveniently, I would recommend a visit now. Dwarf blazing star can be seen primarily on the knoll on the North Unit. This is just a five-minute stroll from the parking lot. Rough blazing star is all over the preserve, although most lush on the North Unit and Saddle. 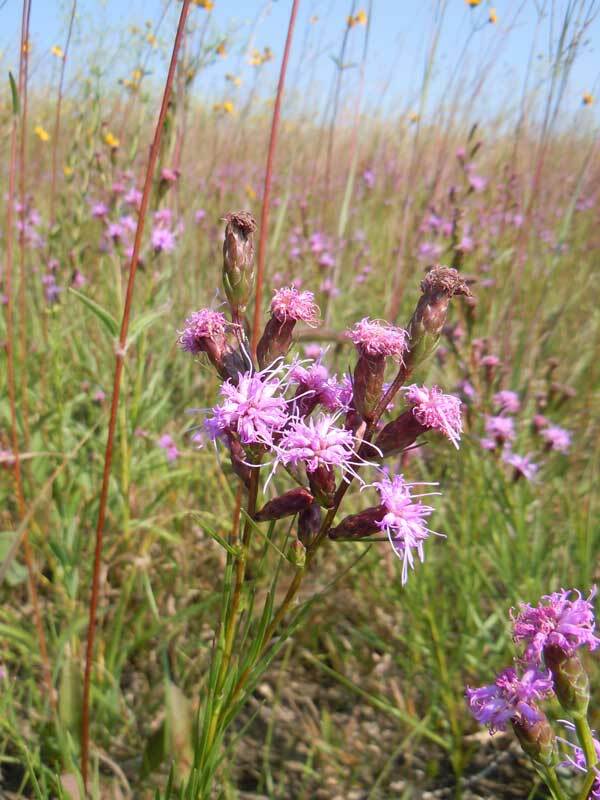 In addition to the remnant populations, there is a substantial planted population in the Gateway Prairie. This is worth seeing if you are planning to plant a prairie. Although this species was in our seed mix, at least some of the plants have probably moved into the Gateway Prairie from the remnant. For the past five or six years, rough blazing star populations have been pretty skimpy here, with none all during last summer's drought. It is encouraging to see how well they and the rest of the prairie have recovered. Certainly this summer's good rain has been a major factor. In addition to the two blazing stars, the following are in full bloom: stiff goldenrod, showy sunflower, naked (or western) sunflower, upland boneset, big bluestem, and Indian grass. Past blooming and starting to set seed are (among others) compass plant, rosin weed, yellow coneflower, butterfly milkweed, short green milkweed, and Monarda. In the far south part of the South Unit are large patches of a species we aren't too wild about: woodland sunflower. We have never had woodland sunflower here before, but there is so much now that you can even see the color from County F.
A final note: our work to eradicate sumac is being successful. All the large populations that we have been working intensively on for the past 4-5 years are gone. We will be back for careful monitoring in early October when sumac leaves will have turned red. Upland boneset (Eupatorium sessilifolium) is an uncommon but attractive member of the oak savanna understory flora. It has a Conservation Coefficient of 9, and is on the Wisconsin DNR list as Special Concern. Although definitely a savanna species, for some reason it was left out of the Atlas of the Wisconsin Prairie and Savanna Flora. Initially we had only a single population of this species at Pleasant Valley Conservancy, which consisted of five plants. This population (in Unit 8 near the South Fire Break) has spread extensively since we started annual savanna burns. After five years it had enlarged to over 25 plants. In addition it spread to other areas in the unit, and recently has crossed the walking trail into Unit 19A. Flowering and seed set were good and we attempted to raise plants in the greenhouse. Unfortunately, seed germination was very low, so we only got a few plants to transplant. However, these transplants became well established and flourished. We have continued to raise new plants yearly and now we have quite a few stands across our ridge-top savanna, primarily in the dolomite areas. 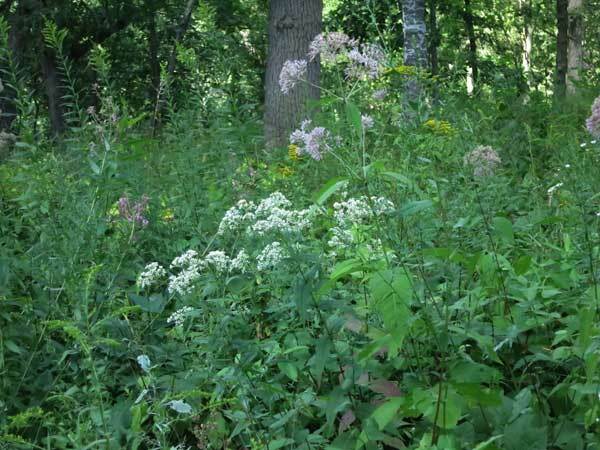 Upland boneset (white flowers) in an area with purple Joe Pye weed and Canada trefoil. Right now upland boneset is the only species in the savanna with small white flowers and is therefore easy to spot during a walk-through. The sessile leaves are the best identification characteristic. The related species tall boneset (Eupatorium altissimum) is still in bud and its inflorescences are off-white. 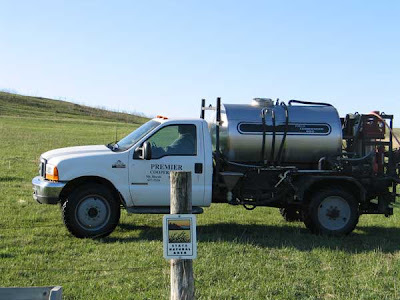 As the distribution map shows, most of the sites in Wisconsin are in the Driftless Area. The single "dot" in Dane County is misleading, since Kathie and I have found quite a few other sites. One of the more interesting is a rather large population in the middle of the prairie in the South Unit at Black Earth Rettenmund Prairie. Should a savanna species be able to thrive in an open prairie? As it turns out, the South Unit at Rettenmund had become fairly wooded during the 50 years of neglect before the Prairie Enthusiasts started restoration work, preumably favoring the development of upland boneset. Quite a few large honeysuckle bushes were removed in the area where the upland boneset now flourishes. Although the U.S. distribution map for this species shows it throughout the east, it is considered endangered or threatened in a number of states, including Minnesota, Michigan, New Hampshire, and Vermont. Prairie dock (Silphium terebinthinaceum) is near its western distribution limit in our part of Wisconsin, although the details are not very well established. This Silphium is distinguished by its very large and conspicuous basal leaves and its tall flower stalks (over 10 feet). It is typically found in deep-soil wet-mesic prairies, where its roots can penetrate 10 feet or more. On the map below, from the UW-Madison Herbarium, the dots show the locations in Wisconsin of all prairie dock collections. The westernmost site in Dane County is a railroad prairie on U.S. 14 just west of the Village of Cross Plains. This population has been studied by generations of botanists (including Curtis). However, shown on the map below are two farther west locations, not represented in Herbarium collections. A large population known to many prairie people is found along County JJ at the edge of Vermont Creek 4.47 miles farther west (see photo). Finally, 2.54 miles still farther west is a large population at Pleasant Valley Conservancy. Although the PVC population was planted, the Vermont Creek population is native to its site. A very large population of prairie dock along the edge of Vermont Creek, County JJ, in western Dane County. The unanswered question is why there are no populations farther west in Wisconsin. Prairie dock is fairly common in Missouri (all the way to the Ozarks), and populations are known in Dubuque and Jackson Counties in Iowa, and Albert Lea (Freeborn County), Minnesota. One possibility is that the preferred wet-mesic habitat of prairie dock is mostly absent from the Driftless Area of Wisconsin. However, although the main populations at Pleasant Valley Conservancy are in wet-mesic areas, we do have two small populations growing (and flowering) on a savanna and a prairie on the ridge-top, a long way from wet-mesic conditions. Although we did not intentionally plant prairie dock seed in these two areas, there is always the possibility that some seed contaminated our mixes. Either way, these plants are thriving. NOTE ADDED Nov 27, 2013!! 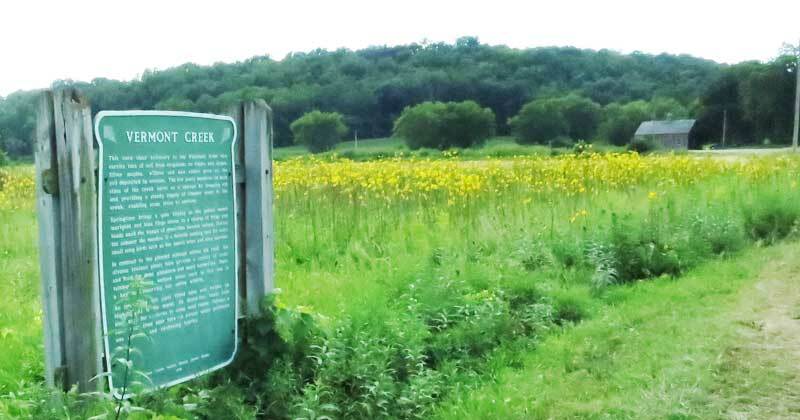 I recently discovered that in a post of August 31, 2008 I had described a single prairie dock plant flourishing in an Iowa County prairie remnant. This is 10 miles west of the last native population at County JJ. From smooth brome to good prairie! When the Nature Conservancy acquired Black Earth Rettenmund Prairie in 1986, a one-acre strip on the north side was in alfalfa. Although cropping was discontinued immediately, there was no restoration work done there except an occasional burn. Predictably, this patch quickly turned into smooth brome (Bromus inermis). It was a little embarassing because the entrance to the preserve went right through this patch, not a good introduction for prairie visitors. For a couple of years in the early 2000s Kathie and I tried burning followed by overseeding, but we soon determined that this approach was going to take too long. We needed herbicide to get rid of the smooth brome. So here was the procedure we used: 1) Burn the field in early December (2004) to get rid of all the thatch. 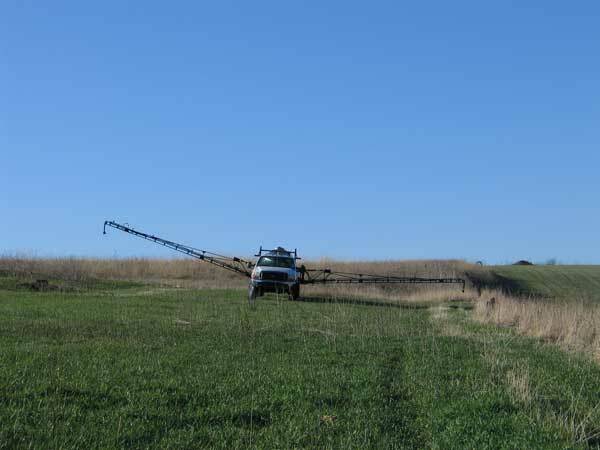 2) On April 14, 2005, when the smooth brome was about 4" tall and no prairie plants were up yet, have Premier Ag Co-op spray with glyphosate (see photo). 3) About a week later, plant the whole field with a complete prairie seed mix. 4) Burn annually. 5) More planting after each burn. This turned out to be the best prairie planting we have ever done. 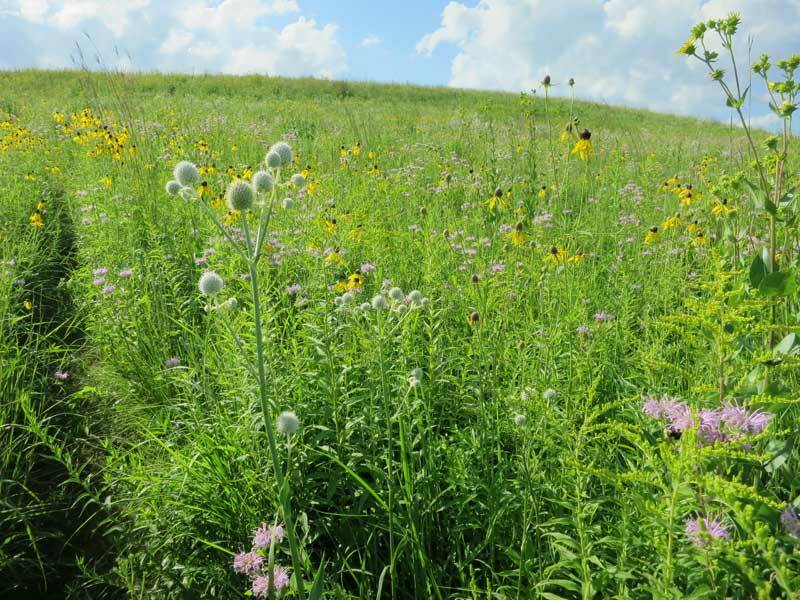 The diversity is high, and some of the more conservative species, such as lead plant, rattlesnake master, and compass plant, are well established. In addition, species such as wood betony have moved in from the remnant. We call this area Gateway Prairie. It took about 15 minutes to spray the whole field. Gateway Prairie July 2013, looking south towards the original remnant. After 8 years of burns and overseeding. Maintenance of Gateway Prairie has been quite easy. Sweet clover, the worst problem at Rettenmund, has never been a problem here. This year for the first time we had a crew do a sweep through the prairie for invasive brush (gray dogwood, brambles). 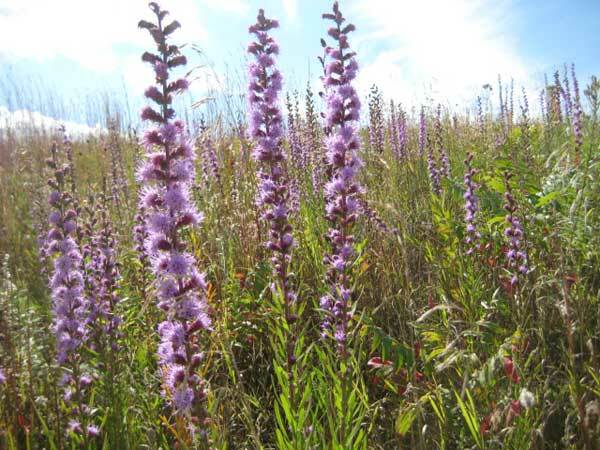 At Black Earth Rettenmund Prairie within the next week or so we are anticipating a large display of two species of blazing star. Both dwarf blazing star (Liatris cylindracea) and rough blazing star (L. aspera) should be in full bloom as there are many plants in bud right now. The best displays will be on the north unit (closest to the Preserve entrance). Dwarf is best at the top of the knoll, and rough on the west facing hill, although there should be good flowers throughout the Preserve. We had a successful work party yesterday, and volunteers got to see the early beginnings of this floral display. The focus yesterday was on invasive brush, especially wild grape, which is fairly extensive. Each stem was cut with a hand clippers and the cut stem treated with 20% Garlon 4 in oil. Last Tuesday our intern crew (supported by the Savanna Oak Foundation) worked at Rettenmund, hand pulling the remaining scattered sweet clover. Because it was in the late stages of flowering, all plants were bagged and transported to our dump, which will be burned at the first snow. Also last Tuesday, Amanda mowed all the trails, so it should now be easy to walk the whole Preserve.